Rooms from $75.99 per night. Description This Marietta, Georgia hotel has an outdoor pool, free internet access and non-smoking guest rooms. This hotel is also pet friendly. With everything you need on the road and a price that's very down to earth Quality Inn Marietta wins praise from our guests. 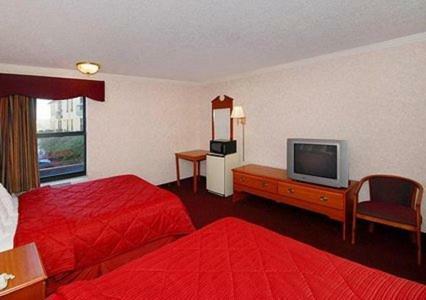 This 102-room motel on three floors has interior corridors. It offers free Wi-Fi in all rooms along with free local calling cable TVs microwaves and refrigerators. Non-smoking rooms can be requested. Quality Inn Marietta gets its guests' day off on the right foot with a free Wall Street Journal and a free hot deluxe breakfast buffet. Fax and copy services are available and the outdoor seasonal pool and fitness room will help you unwind and stay in shape. There's an on-site laundry facility which can be a lifesaver on the road. Parking is free and pet-friendly policies apply. Quality Inn Marietta is less than three miles from Dobbins Air Force Base and 10 minutes from Lockheed-Martin. Six Flags White Water theme park is less than four miles from the motel. Downtown Atlanta is a 25-minute drive. Hartsfield Jackson Atlanta International Airport is 25 miles away. 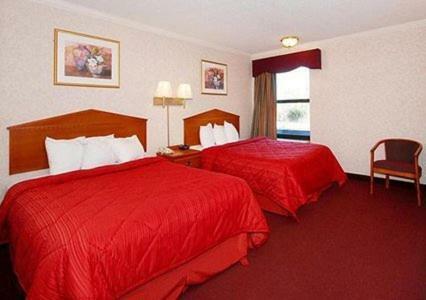 Add Quality Inn Marietta to your free online travel itinerary.